1) POINT of View Fixing a Broken Model How Recordkeepers and Sponsors can work together to repair the retirement industry by Barbara March While many great people and organizations are trying to solve America&rsquo;s retirement challenge through legislative and investment product means, we at BridgePoint believe there is another part of the equation that must be addressed in order to build a healthy retirement system. retirement industry will still be significantly compromised. Why? ï‚· The Scale Challenge. The &ldquo;scale challenge&rdquo; as we will call it, cannot solve America&rsquo;s retirement crisis on its own, but it is a contributing factor and is within the immediate control of Sponsors, Advisors and Recordkeepers. (Scale is defined as each subsequent activity costing less and being produced at a higher quality than the last activity). 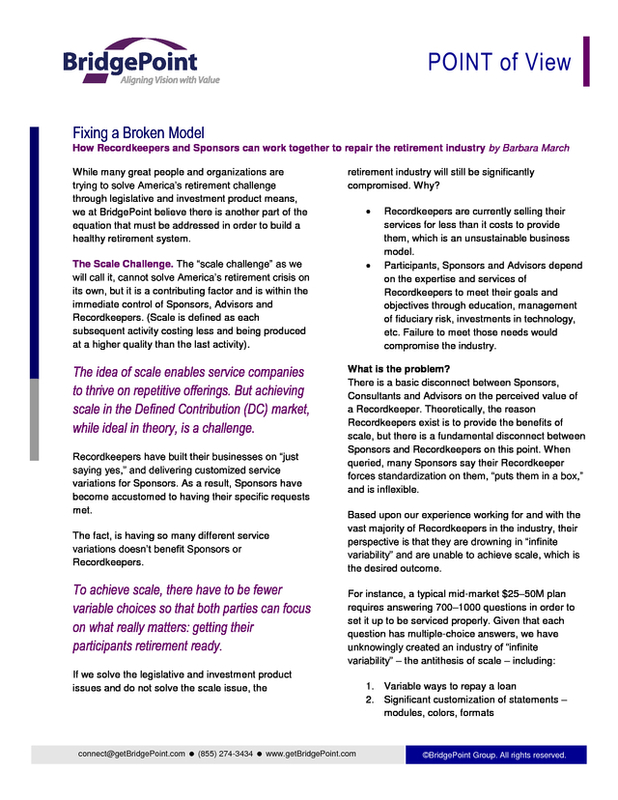 The idea of scale enables service companies to thrive on repetitive offerings. But achieving scale in the Defined Contribution (DC) market, while ideal in theory, is a challenge. Recordkeepers have built their businesses on &ldquo;just saying yes,&rdquo; and delivering customized service variations for Sponsors. As a result, Sponsors have become accustomed to having their specific requests met. The fact, is having so many different service variations doesn&rsquo;t benefit Sponsors or Recordkeepers. To achieve scale, there have to be fewer variable choices so that both parties can focus on what really matters: getting their participants retirement ready. ï‚· Recordkeepers are currently selling their services for less than it costs to provide them, which is an unsustainable business model. Participants, Sponsors and Advisors depend on the expertise and services of Recordkeepers to meet their goals and objectives through education, management of fiduciary risk, investments in technology, etc. Failure to meet those needs would compromise the industry. What is the problem? There is a basic disconnect between Sponsors, Consultants and Advisors on the perceived value of a Recordkeeper. Theoretically, the reason Recordkeepers exist is to provide the benefits of scale, but there is a fundamental disconnect between Sponsors and Recordkeepers on this point. When queried, many Sponsors say their Recordkeeper forces standardization on them, &ldquo;puts them in a box,&rdquo; and is inflexible. Based upon our experience working for and with the vast majority of Recordkeepers in the industry, their perspective is that they are drowning in &ldquo;infinite variability&rdquo; and are unable to achieve scale, which is the desired outcome. For instance, a typical mid-market $25&ndash;50M plan requires answering 700&ndash;1000 questions in order to set it up to be serviced properly. 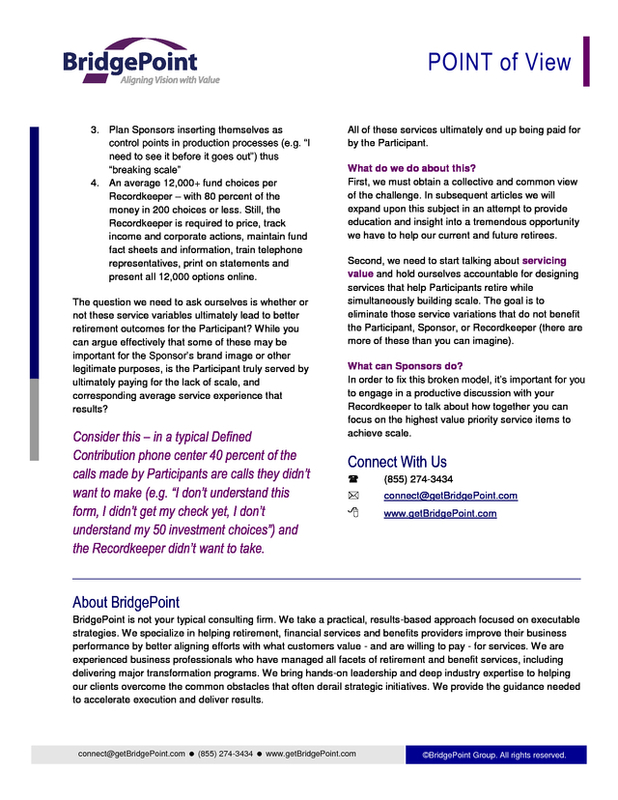 Given that each question has multiple-choice answers, we have unknowingly created an industry of &ldquo;infinite variability&rdquo; &ndash; the antithesis of scale &ndash; including: If we solve the legislative and investment product issues and do not solve the scale issue, the connect@getBridgePoint.com ï€½ (855) 274-3434 ï€½ www.getBridgePoint.com 1. Variable ways to repay a loan 2. Significant customization of statements &ndash; modules, colors, formats &copy;BridgePoint Group. All rights reserved. 2) POINT of View 3. Plan Sponsors inserting themselves as control points in production processes (e.g. &ldquo;I need to see it before it goes out&rdquo;) thus &ldquo;breaking scale&rdquo; 4. An average 12,000+ fund choices per Recordkeeper &ndash; with 80 percent of the money in 200 choices or less. Still, the Recordkeeper is required to price, track income and corporate actions, maintain fund fact sheets and information, train telephone representatives, print on statements and present all 12,000 options online. 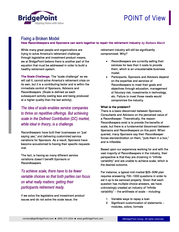 The question we need to ask ourselves is whether or not these service variables ultimately lead to better retirement outcomes for the Participant? While you can argue effectively that some of these may be important for the Sponsor&rsquo;s brand image or other legitimate purposes, is the Participant truly served by ultimately paying for the lack of scale, and corresponding average service experience that results? Consider this &ndash; in a typical Defined Contribution phone center 40 percent of the calls made by Participants are calls they didn&rsquo;t want to make (e.g. &ldquo;I don&rsquo;t understand this form, I didn&rsquo;t get my check yet, I don&rsquo;t understand my 50 investment choices&rdquo;) and the Recordkeeper didn&rsquo;t want to take. All of these services ultimately end up being paid for by the Participant. What do we do about this? First, we must obtain a collective and common view of the challenge. In subsequent articles we will expand upon this subject in an attempt to provide education and insight into a tremendous opportunity we have to help our current and future retirees. Second, we need to start talking about servicing value and hold ourselves accountable for designing services that help Participants retire while simultaneously building scale. The goal is to eliminate those service variations that do not benefit the Participant, Sponsor, or Recordkeeper (there are more of these than you can imagine). What can Sponsors do? In order to fix this broken model, it&rsquo;s important for you to engage in a productive discussion with your Recordkeeper to talk about how together you can focus on the highest value priority service items to achieve scale. 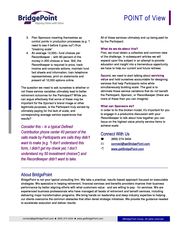 Connect With Us ï€¨ (855) 274-3434 ï€ª connect@getBridgePoint.com ï€¸ www.getBridgePoint.com _____________________________________________________________________ About BridgePoint BridgePoint is not your typical consulting firm. We take a practical, results-based approach focused on executable strategies. We specialize in helping retirement, financial services and benefits providers improve their business performance by better aligning efforts with what customers value - and are willing to pay - for services. We are experienced business professionals who have managed all facets of retirement and benefit services, including delivering major transformation programs. We bring hands-on leadership and deep industry expertise to helping our clients overcome the common obstacles that often derail strategic initiatives. We provide the guidance needed to accelerate execution and deliver results. connect@getBridgePoint.com ï€½ (855) 274-3434 ï€½ www.getBridgePoint.com &copy;BridgePoint Group. All rights reserved.